One of my most recent blog entries(1) summarized roughly 10 years of research related to the consequences of inflammatory processes in the periphery of the body, such as the gut, and how this was driving brain degenerative inflammatory processes within the brain. One of the key findings from that research was how pathogenic bacterial waste products known as “lipopolysaccharides” , (LPS) would trigger an immune response, and this immune response would then trigger the brains immune cells, the microglia, to become overly active and degrade brain cells. (LPS is basically small parts of the cell wall of the bad bacteria.) This response is called “microglial activation”. You’ll be hearing a lot more about it over the next 10 -20 years, because stopping this overactivation is central to correcting all degenerative neurological conditions, including Alzheimers, Autism, Anxiety, ALS, Insomnia, non-situational Depression, MS, and many endocrine system disorders including the unbiquitous adrenal and thyroid disorders that so many people are struggling with right now. 1) Pathogenic bacteria overgrowth in the intestines creates waste products (LPS) which activate the immune system to respond and produce a chemical called “Interleukin 1b”. 2) The activity of this immune response is communicated to the brain by way of the vagus nerve which connects the brain with our “second brain”, which is also called “the gut”. 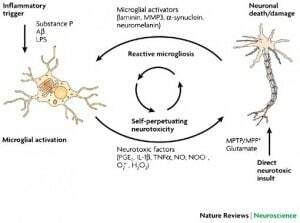 3) The brains immune system cells called “microglia” become overly excited by the ongoing response to the toxins being produced in the gut (or elsewhere in the body), and these microglia break down neurons. So how does Monsanto contribute to this? The proponents of Monsanto’s version of GMO farming like to argue that glyphosate is fine to use since the enzymes that kill the weeds which are affected by the RoundUp don’t exist in the human body, therefore they can’t hurt humans(3). Where their argument falls apart is that the enzymes do exist in the microbes which make up our gut, and the importance of a healthy gut ecology is central to good health. In other words, RoundUp residue is disrupting our “microbiome”, and this disruption of our microbiome can result in an overgrowth of pathogenic bacteria relative to our beneficial bacteria (4). Among those toxic bacteria which are known to become dominant is Clostridium Botulinum, which produces one of the most potent bacterial toxins known to man. (4.5)The dominance of these pathogenic bacteria is amplified with the consumption of sugar and high fructose syrup so dominant in the Standard American Diet (SAD), as these harmful microbes love to eat the sweets so many Amercian’s put into their bodies. Likewise, the artificial sweeteners either disrupt our gut flora (5) or they fuel the inflammatory processes within the brain directly. (6) Also noteworthy, is the research which shows how the microbes in our gut will highly influence our bodies cravings. In other words, much of your cravings for junk food and sweets may be coming from an unhealthy gut microbiome. (6.5) Recent research involving the parasite associated with Toxoplasmosis has shown that the parasite will affect behavior beyond just food cravings, too. (6.6) The following video is a nice overview of how our microbiome affects our health. So how do we stop this madness? Unfortunately, there is a fascistic relationship between the government and Monsanto. Our current “Food Safety Czar” at the FDA is former VP from Monsanto, Michael Taylor. Additionally, Clarence Thomas, who sits on the Supreme Court, has never recused himself of any Supreme Court case related to Monsanto, despite a clear conflict of interest given the fact that Clarence Thomas is a former lawyer for Monsanto. (8) Government is now acting to make sure that the Monsanto machine isn’t stopped. This is going to require a grass roots campaign that starts with YOU! Now that you have this information, please share it with others. Beyond that, “Origins” is an excellent documentary which covers many of the problems with our health and how it relates to conventional farming practices like I described above. If you’re interested in learning more about what I’ve detailed here, watch this video with your friends and family, and help make it viral! The mainstream media isn’t going to do this. Like it or not, stopping the Monsanto machine requires our collective action.